Please note the ACP is not a higher education provider and courses offered are intended to only provide medical education and training in the related field. The College's training programs are aimed at providing practitioners with the skills required to practice techniques and manage patients within the area of Phlebology, with the highest quality of care. The ACP has undergone significant changes in its education and training curriculum. The current curriculum is comprehensive and recognised by the Union Internationale De Phlebologie (UIP) as an international benchmark. The following information is designed to be an overview of how the training program operates. For comprehensive guidelines, please review the Training Handbook below. *Please note that all training positions for 2019 have been filled. For practitioners who wish to complete ONLY THE THEORY component of training which consists of the online basic training modules only. This certificate does not imply in any way that the college endorses or accredits the clinical skills or practice of the candidate. Successful applicants are required to undergo a minimum of 10 days of supervised training at an Accredited Training Centre (ATC) during the training year. Applicants are required to pass the Written Examination to be invited to sit for the Clinical Examination in that year. At the successful completion of the examinations and having met all other training requirements, the candidate is awarded the title ‘Certified Sclerotherapist’. At this stage, the practitioner can start work in private practice as a ‘Certified Sclerotherapist’. This introductory year is designed to give the trainee a sound base from which to further develop their skills and allow progress to further training. Through the Advanced training, trainees acquire skills and a broad knowledge of the theory and practice of phlebology and the basic sciences underpinning them to perform more advanced procedures such as Ultrasound Guided Sclerotherapy (UGS) and Endovenous Ablation (EVLA).Successful applicants are required to undergo a minimum of 20 days of supervised training per year at an Accredited Training Centre (ATC). Applicants are required to pass the Written Examination to be invited to sit for the Clinical Examination in that year. Successful completion of the basic training course is a prerequisite to enter the advanced training program. The purpose of Fellowship Training is to build on existing skills so that trainees acquire a broad knowledge of the theory and practice of phlebology and the basic sciences underpinning them. During Fellowship Training, trainees acquire skills in the treatment of more complex phlebological conditions such as venous thromboembolism and vascular malformations. Those who pass both the written and clinical Fellowship Examinations and satisfy all other requirements of the training program will be awarded Fellowship of the Australasian College of Phlebology and entitled to use the title ‘Phlebologist’. Successful completion of the Advanced Training course is a prerequisite to enter the Fellowship program. 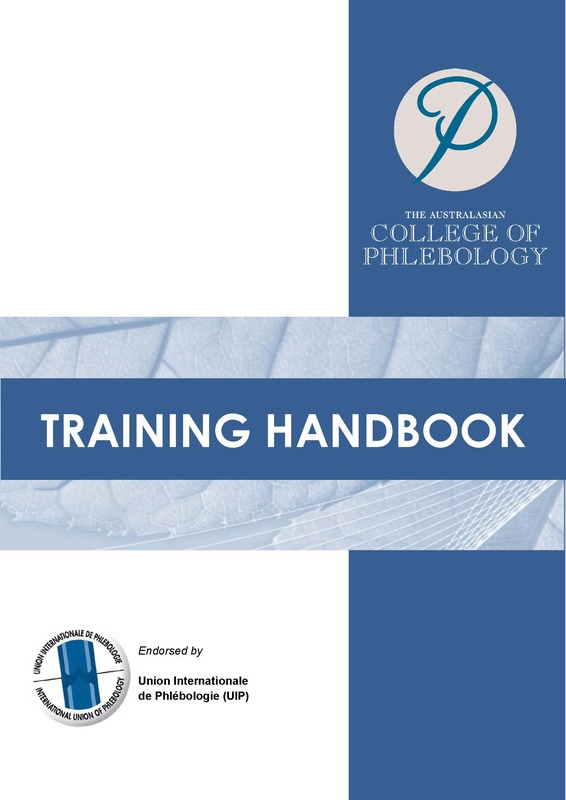 A number of pre-requisites must be satisfied in order to be eligible to apply for a training program with the Australasian College of Phlebology. A person who has satisfied the above prerequisites is eligible to apply for admission to the College Training Program. For detailed info please review the training handbook by clicking the image below.